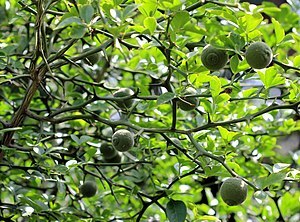 ^ Citrus trifoliata L.. In: The Plant List (2013). Version 1.1. Published on the Internet; http://www.theplantlist.org/ [2017-8-31]. This page is based on the Wikipedia article 枳; it is used under the Creative Commons Attribution-ShareAlike 3.0 Unported License (CC-BY-SA). You may redistribute it, verbatim or modified, providing that you comply with the terms of the CC-BY-SA.